This is lesson 4 of 42. This series is currently in-progress and will have new lessons each week, visit Bethany’s author page to see the latest available. 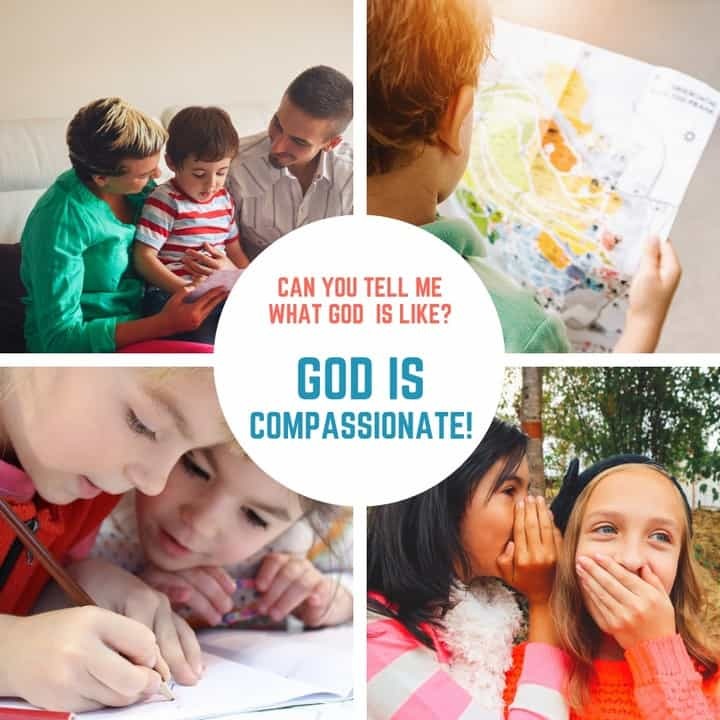 Get started by showing kids the page that says “God is compassionate” and ask if any of the kids in the group know what that word means, or if anyone has any guesses what it might mean. Ask kids in the group to read the other supporting verses (listed at the top of the page) to see times in the Bible where God is seen as being compassionate and after each verse, ask if they have any more of an idea of what it might mean that God is compassionate. Explain that being compassionate means caring about the needs of others, feeling sorry for them and doing something to help them out. Tell the kids that this morning we’re going to look at a familiar story in the Bible where God showed compassion to people. After this brief introduction, designate children to be the following characters and explain that they will act out their parts while you read the story from these verses – Jonah 1:1-3, 1:9, 1:12, 1:17, 2:1, 2:10, 3:1-3, 3;5, & 3:10.
Who was the prophet that God chose to use in this story? Where did God send Jonah? What was he to do there? How did Jonah respond to God’s command to go to Nineveh with the good news? Why didn’t he want to go to Nineveh? Was Jonah able to hide from God on the ship? What did God do to get the attention of Jonah? How did God rescue Jonah? Once out of the fish, what did God tell Jonah to do? What was his response this time? How did the people of Nineveh respond to the call to repent? What was Jonah’s response when God had compassion on the people and forgave them? Since motions & actions help kids remember, choose an action for COMPASSIONATE. A good motion might be to hug your neighbor. Read the memory verse (Psalm 86:15) a few times together and do the motion for awesome. Ask the group to remind you what the message was that Jonah was to preach to the people of Nineveh (basically….God is going to destroy you because of your sinfulness). Explain that although this sounds harsh that this is the truth for every single person in the world. The Bible clearly tells us in Romans 3:23 that we are all sinners and in Romans 6:23 that our sin deserves death. Throughout the Bible, the payment for sin was always blood, as we see in the Old Testament stories of sacrifice. But, because of His great love, while we were still sinners who deserved punishment (Romans 5:8), God sent Jesus to earth to die as the perfect, spotless lamb of God (John 1:29) who would take away the sin of the world. Just like the people of Nineveh, we all deserve to be punished for our sin, but the good news is that Jesus has already taken that punishment for us. In our story this morning, when the people of Nineveh repented of their sin and turned to God, God had compassion on them and saved them. God has already shown His love and compassion for us through Jesus, but like the people of Nineveh we are still called to repent of our sin and turn to Jesus for salvation. Give each child a blank piece of paper provide markers or colored pencils. Encourage them to write the word compassionate somewhere on the paper and then write or draw something to help them remember this attribute of God. They could write the definition for compassionate or the memory verse or they could illustrate any of the passages you read about God being compassionate. After a few minutes, bring the group back together and give kids time to share what they have drawn or written. Pray that the kids in the group would come to know God more and more each week through this study and that they would remember that all of us are sinners who need to be saved and that they would thank God for the gift of Jesus and the gift of salvation for all who believe in Jesus. Filed Under: Jonah, Lesson Plans, What is God Like?